Over the last couple days you've learned how to set up a Twitter account and make fun and practical use of the service. Now let's look at ways you can access Twitter without being tied to your PC. For starters, if you have a cell phone (any cell phone--doesn't have to be anything fancy like a Droid or iPhone), you can take advantage of Twitter's SMS features to send and receive tweets. First, open Twitter in your browser, click Settings, and then click Mobile. Follow the instructions to pair your phone with your Twitter account. With that done, any text message you send to 40404 becomes a tweet. A better bet all the way around is to find a Twitter app for your phone--assuming your phone runs apps, that is. They're available for all the major platforms: Android, BlackBerry, iPhone, WebOS, Windows Mobile, etc. These apps let you tweet, retweet, send direct messages, view your feeds, and so on. Many of them are free; others cost a couple bucks. 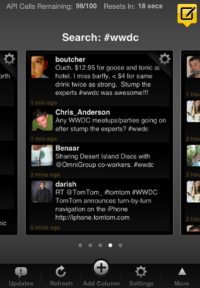 If you're wondering, I'm partial to TweetDeck for iPhone (pictured). What's your preferred method for using Twitter on the go?